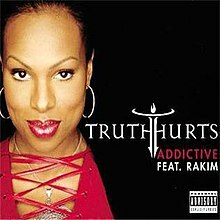 "Addictive" is a song by R&B singer Truth Hurts. It was the lead single from her debut album, Truthfully Speaking. One of the label's few R&B hits. "Addictive" features a verse from Rakim, and is based on a Hindi music sample, which eventually brought on a $500 million lawsuit against Aftermath. The song was her only one to chart on the Billboard Hot 100, peaking at number nine, and selling over 600,000 copies in the US. It was also a top five hit in UK, France and Switzerland, and went gold in several countries. "When I B on the Mic"
Steve "Static" Garrett wrote the song's lyrics, and the record was produced by DJ Quik. Quik sampled for its instrumental track a Hindi-song he heard on television early one morning. The sample turned out to be "Thoda Resham Lagta Hai", a 1981 song by Indian singer Lata Mangeshkar for the 1981 movie Jyoti, which Aftermath neglected to clear the rights to. Copyright holders Saregama India, Ltd. issued a cease-and-desist order, which went unheeded. On September 12, 2002, Saregama filed a $500 million lawsuit against Aftermath and parent company Universal Music Group, and filed an injunction to prevent further performances or broadcasts of the "Addictive" song. "Addictive" has further similarities to Indian music producer Harry Anand's 2002 remix of "Thoda Resham Lagta Hai" called "Kaliyon Ka Chaman" but it is unknown whether "Addictive" or "Kaliyon Ka Chaman" came first. This song is still in recurrent rotation on many top-40, rhythmic, and urban stations. A remix has also been made, produced by Dr. Dre featuring an additional verse by Rakim. Contains a sample of "Thoda Resham Lagta Hai" by Lata Mangeshkar, from the Bollywood film Jyoti (1981). Contains a sample of "Do it 'Till You're Satisfied" by B.T. Express. ^ "Dr. Dre, Interscope Stung With $500 Million Lawsuit Over 'Addictive'". VH1. September 19, 2002. Archived from the original on 13 April 2009. Retrieved 30 June 2012. ^ "Top 10 Bollywood Samples". WhoSampled. May 23, 2011. Retrieved 30 June 2012. ^ Roberts, Tamara (2016). "Toward an Afro Asian Theory of Critique: The "Addictive" Case". Resounding Afro Asia: Interracial Music and the Politics of Collaboration. Oxford University Press. ISBN 978-0-19-937741-1. ^ "Austriancharts.at – Truth Hurts feat. Rakim – Addictive" (in German). Ö3 Austria Top 40. ^ "Ultratop.be – Truth Hurts feat. Rakim – Addictive" (in Dutch). Ultratop 50. ^ "Ultratop.be – Truth Hurts feat. Rakim – Addictive" (in French). Ultratop 50. ^ "Danishcharts.com – Truth Hurts feat. Rakim – Addictive". Tracklisten. ^ "Lescharts.com – Truth Hurts feat. Rakim – Addictive" (in French). Les classement single. ^ "Offiziellecharts.de – Truth Hurts feat. Rakim – Addictive". GfK Entertainment Charts. ^ "The Irish Charts – Search Results – Addictive". Irish Singles Chart. ^ "Italiancharts.com – Truth Hurts feat. Rakim – Addictive". Top Digital Download. ^ "Nederlandse Top 40 – week 39, 2002" (in Dutch). Dutch Top 40 Retrieved 26 March 2018. ^ "Dutchcharts.nl – Truth Hurts feat. Rakim – Addictive" (in Dutch). Single Top 100. ^ "Charts.nz – Truth Hurts feat. Rakim – Addictive". Top 40 Singles. ^ "Top40-charts.com". Retrieved November 24, 2015. ^ "Official Scottish Singles Sales Chart Top 100". Official Charts Company. Retrieved 26 March 2018. ^ "Swedishcharts.com – Truth Hurts feat. Rakim – Addictive". Singles Top 100. ^ "Swisscharts.com – Truth Hurts feat. Rakim – Addictive". Swiss Singles Chart. ^ "Official R&B Singles Chart Top 40". Official Charts Company. Retrieved June 15, 2018. ^ "Truth Hurts Chart History (Hot 100)". Billboard. ^ "Truth Hurts Chart History (Hot R&B/Hip-Hop Songs)". Billboard. ^ "Truth Hurts Chart History (Pop Songs)". Billboard. ^ "Truth Hurts Chart History (Rhythmic)". Billboard. ^ "Jaaroverzichten 2002" (in Dutch). Ultratop. Retrieved June 21, 2018. ^ "Rapports annuels 2002" (in French). Ultratop. Retrieved June 21, 2018. ^ "Classement Singles - année 2002" (in French). SNEP. Archived from the original on April 4, 2012. Retrieved June 21, 2018. ^ "Top 100 Single-Jahrescharts 2002" (in German). GfK Entertainment. Retrieved June 21, 2018. ^ "Single top 100 over 2002" (pdf) (in Dutch). Top40. Retrieved 2 May 2010. ^ "Jaaroverzichten - Single 2002" (in Dutch). MegaCharts. Retrieved June 21, 2018. ^ "Swiss Year-End Charts 2002" (in German). Retrieved June 21, 2018. ^ "The Official UK Singles Chart" (PDF). UKChartsPlus. Retrieved June 21, 2018. ^ "Top 100 Songs of 2002 - Billboard Year End Charts". Bobborst. Retrieved June 21, 2018. ^ "Classement Singles - année 2003" (in French). SNEP. Archived from the original on April 4, 2012. Retrieved June 21, 2018. ^ "Ultratop − Goud en Platina – singles 2002". Ultratop. Hung Medien. Retrieved March 17, 2019. ^ "French single certifications – Truth Hurts – Addictive" (in French). Syndicat National de l'Édition Phonographique. Retrieved March 17, 2019. ^ "The Official Swiss Charts and Music Community: Awards (Truth Hurts feat. Rakim; 'Addictive')". IFPI Switzerland. Hung Medien. Retrieved March 17, 2019.